How is the business travel industry catering for needs of disabled travellers? Travelling for business alone can be a daunting prospect for any experienced business traveller, even more so if you have extra challenges or needs due to a disability. The UK has over 40 commercial airports located in different places across the country with London alone hosting 5. The CAA recently reviewed assistance facilities & services available at the UK’s top 30 airports with Humberside, Birmingham, Norwich, Glasgow and Prestwick all rated as “Very Good”. An additional 20 airports were scored as “Good” and 4 as “Poor” and needing improvement. From these findings we can see that airports have come along way in creating accessible and inclusive spaces for disabled travellers with a small amount needing to improve on their services. Airports including Gatwick, Manchester,Birmingham, Bristol, Leeds Bradford, Belfast and Dublin are working closely with OCS special assistance to provide hidden disability lanyards to travellers for those who may need assistance or extra time. Virgin Atlantic are leading the way when it comes to assisting disabled travellers. They have produced heart shaped aircraft badges for their passengers who need extra assistance or have hidden disabilities which can be worn, printed or carried on a mobile device recognised by crews worldwide. Not only this, Virgin also invite disabled people to experience a mock-up training aircraft for familiarisation prior to a trip and to create an improved experience. In addition to this Virgin (with help from visually impaired travellers) have developed a tablet which speaks to help a visually impaired travellers experience, when operating a touch screen entertainment system. Wheelchair access/reserved seating is also available should this be a required. 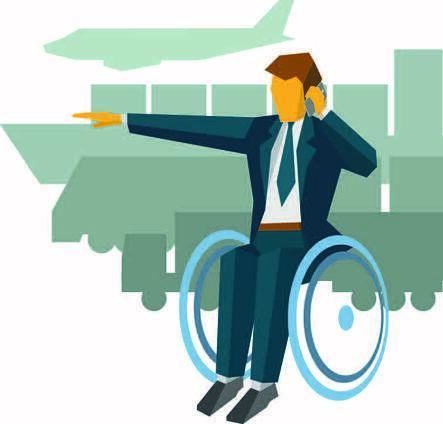 Business travel consultants when booking accommodation for the needs of a disabled business travellers will ask the relevant questions to cater for an individual travellers needs. From step free access, automatic door opening, lift access or ramped areas, Business Travel consultants work as an extension of a company catering and tailoring each business trip to the specific needs of the traveller. It looks like the business travel industry are taking a step in the right direction when it comes to catering for disabled travellers needs, there will always be areas for improvement and as a travel management company ourselves, we aim to ensure all aspects of business travel are a pleasurable experience for all. Traveller Well-being and Duty of Care are paramount for any business who has travelling employees and striking the balance between cost saving and care is still a fine line for many - we have a handy guide here.